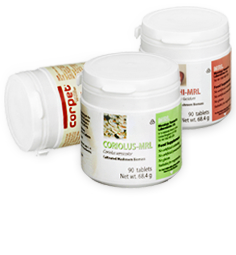 The mushroom nutrition products contain both mycelium and primordia (young fruit body). The proprietary technology used in the cultivation of MRL products ensures that the products are free from contamination by other fungi and heavy metals. The powder is transported from California to Holland. In Holland, the sterile powder is pressed into 500 mg tablets with a film coating which protects the powder from moisture. The production process is undertaken to food grade GMP which ensures that each tablet has 500 mg of a standardised product. MRL also offers 250 g powder presentations with 2 g spoons.